Jean Hofmann Petrosky, born June 12, 1929, in Coatesville, Pa, daughter of Samuel Hofmann and Ann Wilson, died November 2, 2018 following a brief illness. She is survived by 6 children; Terry Petrosky Prager and husband Ken, Thomas Petrosky and wife Maryann, JoAnne Petrosky and husband Michael Weitzman, Timothy Petrosky and wife Shelly, Hugh Petrosky and wife Monica, Allison Petrosky Maguire and husband David; 15 grandchildren, Leah, Abigail, Joshua, Brandon, Danielle, Madeline, Jacquelyn, Olivia, Kyle, Noah, Cora, Andrew, Morgan, Emily, and Braxton; 9 great- grandchildren Leila, Joseph, Caroline, Harrison, Robert, Francesca, Elliot, Owen and Anna and half-sister, Peggi Strouse of Ambler, Pennsylvania. She was beloved by all and will be dearly missed. Jean, and her husband, Robert Petrosky (d. 2013), made Bristol, Tennessee their home in 1978. Following a stroke in 2016, Jean moved to an assisted living community in Knoxville, Tennessee where she resided until her death. Her family would like to express their gratitude for the care she received while a resident at NHC Farragutt. 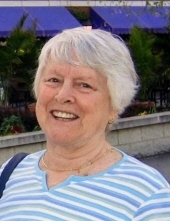 Despite the limitations caused by her stroke, Jean's good nature and humor were ever present - she was quick to smile, and grateful for the care and compassion shown to her. A memorial service will be held Saturday, November 10th at Click Funeral home in Farragut, Tn. starting at 1pm. In lieu of flowers, we ask that donations be made to St. Jude Children's Research Hospital. To send flowers or a remembrance gift to the family of Jean Hofmann Petrosky, please visit our Tribute Store. "Email Address" would like to share the life celebration of Jean Hofmann Petrosky. Click on the "link" to go to share a favorite memory or leave a condolence message for the family.